The Visage Skin Care & Laser Center is owned and supervised by Dr. Scott Gayner and Dr. John Stratis. 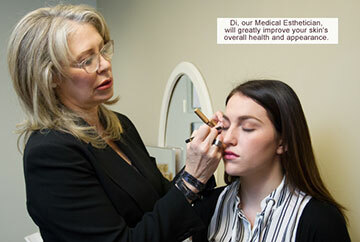 Their medical background gives a unique perspective when compared with other skin care centers in Harrisburg, Pennsylvania that may offer similar services. Our licensed aesthetician, Di, is here to provide you with the information and services you need to attain and keep healthy and beautiful looking skin. She is committed to making each visit informative and enjoyable and looks forward to a long, rewarding relationship with each client. This treatment can bring you healthier, younger-looking skin. Microdermabrasion removes dead surface skin cells and stimulates new cell growth which improves skin elasticity, texture, color and overall appearance. These treatments will also reduce enlarged pores, and exfoliate and suction out clogged pores. Microdermabrasion will correct pigment problems and reduce fines lines generally caused by aging and sun damage. A series of treatments, with regular maintenance visits, ensures optimal, long-lasting results. Today, with the remarkable advances in laser technology, unwanted hair is being removed safely and affordably. Laser hair removal has been researched, tested, and proven to be highly effective in permanently reducing unwanted hair. This treatment uses laser pulses to heat the hair follicle and impair its ability to re-grow. Significantly less hair grows back with each treatment, allowing you to reach your goal of permanent hair removal. Typically, laser hair removal treatments in Pennsylvania are spaced 3 to 4 weeks apart. It is not uncommon for an individual to need 8-10 treatments. Our aesthetician will work with you in designing a schedule to help you achieve your goal. Over time, our skin becomes less elastic. Smoking, stress, and sun exposure can cause lines, wrinkles, and scars. Skin changes may be part of the natural aging process, but you don’t have to like it. Now, a new procedure called GentleWaves® LED Photomodulation® uses natural, variable wavelengths of light to gently stimulate or inhibit cellular activity to reduce the signs of aging. Treatments are painless and require no downtime. IPL Photofacial treatments eliminate redness, broken capillaries, brown spots, fine wrinkles and large pores. The ideal candidate suffers from rosacea, early aging changes, and sun damage. After your first photofacial treatment, your skin will feel smoother and will have a more even tone. These improvements are gradual and will be more visible after each treatment. For more significant wrinkle treatment, consider BOTOX® Cosmetic at our Harrisburg practice. Photo rejuvenation using intense pulsed light (IPL) is now the gold standard of non-ablative treatments. The most recent advance in photorejuvenation is photodynamic therapy (PDT), known as photodynamic skin rejuvenation. Photodynamic skin rejuvenation involves the application of aminolevulinic acid (ALA), a photosensitizing agent, which is then activated with IPL. This results in significant improvement in precancerous conditions such as actinic keratoses, actinically damaged skin, moderate to severe cystic acne and potentially superficial skin cancers. Additionally, it improves wrinkles, pore size, skin texture, pigmentation, rosacea, and sebaceous hyperplasia. Using European techniques, the European Facial begins with a thorough analysis of your skin using the DermaView machine to determine what products are best suited for your skin type. Deep cleansing, toning, exfoliation, and extractions are performed to prepare the skin for a relaxing massage. A masque, chosen to suit your skin’s needs is applied while you are encouraged to enjoy the quiet soothing process of rebalancing your skin. The facial concludes with the application of moisturizer, an eye treatment and sunscreen. Want to relax? Book your European Facial now! Permanent makeup, also known as micro-pigmentation, uses a tattooing process to enhance the look of your face. It is often used to add color to the lips, eyelids, and eyebrows, and also improve definition of features. Have your makeup applied for any occasion. Whether day or night, casual or formal, this service leaves you excited to attend your event without the stress of doing your own makeup! No bride needs the added stress of applying makeup on her “Big Day”. This makeup service consists of a pre-wedding consultation to choose the best colors for the bride and bridal party. Our makeup artist will travel to you. This is a great service for small informal parties, especially for teens and their friends. You will learn a lot about color, trends and have some fun too! For your convenience, we offer facial waxing, body waxing and eyelash/eyebrow tinting. For more information about the Visage Skin Care & Laser Center, Request a consultation online or call the office at (717) 728-1700.